You can use the Axway Sentinel Link Event filter in API Gateway to send cycle link events to Axway Sentinel. These cycle link events are used to link events from two products with two different cycle IDs. 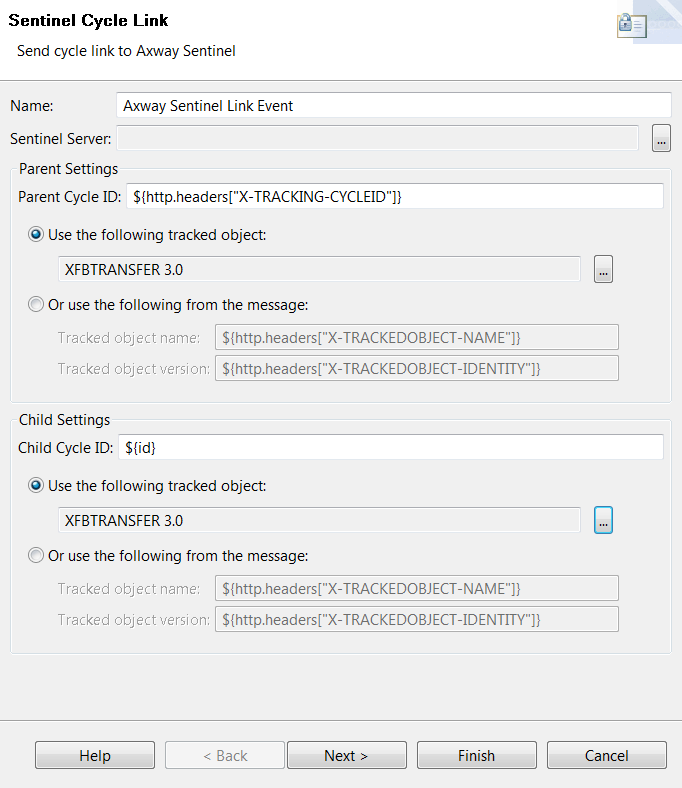 Note You must know the cycle IDs for both products and the tracked object definitions must already exist in Axway Sentinel (see Configure Axway Sentinel). The following figure shows the configuration window for the Axway Sentinel Link Event filter, which is available in the Monitoring category in Policy Studio. Enter the location of the upstream cycle ID contained in the message in the Parent Cycle ID field (for example, the cycle ID of the upstream product such as Axway B2Bi). In the example above the parent cycle ID is taken from the HTTP request headers named X-TRACKING-CYCLEID. You must also specify the tracked object name and version for the parent cycle ID. Enter the cycle ID generated by API Gateway in the Child Cycle ID field. You must also specify the tracked object name and version for the child cycle ID. For more information on configuring the Axway Sentinel Link Event filter, see the API Gateway Policy Developer Filter Reference.